Carli Anne Lloyd was born on 16th July 1982. She is an American professional soccer midfielder who currently plays for Western New York Flash in the National Women’s Soccer League and the United States women’s national soccer team. She is a two-time Olympic gold medalist and scored the gold medal-winning goals in the finals of both the 2008 Summer Olympics and the 2012 Summer Olympics. 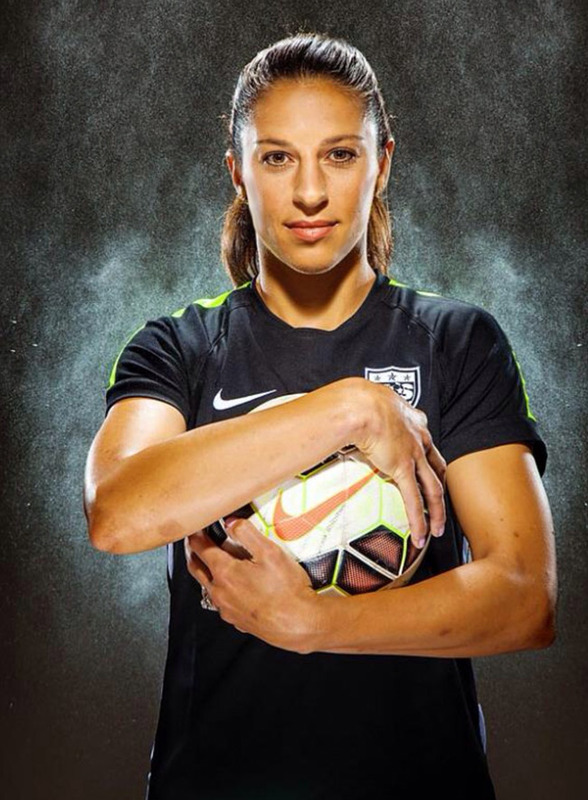 She has represented the United States at two FIFA Women’s World Cup tournaments: first at the 2007 FIFA Women’s World Cup in which she helped the U.S. win bronze and at the 2011 FIFA Women’s World Cup in which the U.S. won silver. She has played in over 160 matches for the U.S. national team and scored over 45 goals. Llloyd played professionally for the Chicago Red Stars, Sky Blue FC, and Atlanta Beat in Women’s Professional Soccer (WPS). She was allocated to the Western New York Flash for the inaugural season of the National Women’s Soccer League in 2013 helping the team win the regular season championship. Born to Stephen and Pamela Lloyd, Carli was raised in Delran Township, a small community located in South New Jersey about twenty minutes northeast of Philadelphia. Lloyd began playing soccer at age five. Of her exposure to soccer at a young age, Lloyd’s mother, Pamela said, “At that age, it was coed, and Carli was hanging with the boys. She always loved it and showed a lot of ability from an early age, but she also has always worked hard.” Lloyd has one brother, Stephen, and a sister, Ashley. Lloyd attended Delran High School from 1997 to 2000 where she played soccer under the tutelage of Rudy “The Red Baron” Klobach. As a high school athlete, she was known for her exceptional ball control and skill at distributing the ball from the midfield. During her senior year, she scored 26 goals and served eight assists while captaining her team to an 18-3 record. The Philadelphia Inquirer twice-named her Girls’ High School Player of the Year in 1999 and 2000. She was named to the Star-Ledger All-State First Team twice and received 1999 and 2000 Parade All-American honors. In 2000, she was named the Courier Post Player of the Year and the South Jersey Soccer Coaches Association (SJSCA) Midfielder of the Year. Lloyd attended Rutgers University from 2001 to 2004 where she played for the Scarlet Knights women’s soccer team under head coach Glenn Crooks. She was named First-Team All-Big East for four straight years – the first athlete at Rutgers to do so. She ended her collegiate career as the school’s all-time leader in points (117), goals (50), and shots. During her freshman season, Lloyd started every match and was the team’s leading scorer with 15 goals for a total of 37 points. She was named to Soccer America’s All-Freshman Team and was the first Rutgers player to earn Big East Rookie of the Year honors. As a sophomore, she was the team’s leading scorer for the second consecutive season with 12 goals and seven assists for 31 points. The same year Lloyd was a finalist for the Hermann Trophy, widely considered the highest accolade for collegiate athletes. During her third season with the Scarlet Knights, she scored 13 goals and served 2 assists for a total of 28 points and was named a Big East Academic All-Star. As a senior, she was a starter for 18 of the 20 games she played, scored 10 goals and served one assist. Lloyd was named the 2004 Big East Midfielder of the Year. On January 11, 2013, Lloyd joined the Western New York Flash in the new National Women’s Soccer League as part of the NWSL Player Allocation. After recovering from a shoulder injury suffered earlier in the year, Lloyd made her debut for the Flash on May 12, 2013 during the team’s 2-1 defeat of FC Kansas City. She scored her first goal in a match against her former club, Sky Blue FC, helping the Flash win 3-0. During a match against the Washington Spirit on June 28, Lloyd scored a hat trick leading the Flash to a 4-0 win. She was subsequently named NWSL Player of the Week for her performance. Lloyd represented the United States at the under-21 level before making the jump to the senior team at the age of 23. As a member of the under-21 team, she played at the Nordic Cup four times winning consecutive titles from 2002 to 2005 in Finland, Denmark, Iceland, and Sweden respectively. During the first round of the 2003 Nordic Cup, she served the assist in the U.S.’ 1-0 win against Denmark. At the 2004 Nordic Cup, she scored two goals and served one assist while starting in every match. The following year at the 2005 Nordic Cup, she scored three times including one goal during the championship match against Norway. Lloyd made her first appearance for the United States women’s national soccer team on July 10, 2005, against the Ukraine. She scored her first international goal on October 1, 2006 against Taiwan. At the 2006 Four Nations Tournament, Lloyd won a third cap. She earned the first two starts of her career at the 2006 Algarve Cup, gaining a place in the starting 11 against Denmark and in the championship game against Germany. She played in 19 games, starting 13, and scored one goal. After scoring once in her first 24 matches with the national team, Lloyd scored four goals at the 2007 Algarve Cup. As the tournament’s top scorer, she was awarded Most Valuable Player tournament honors. Lloyd logged her first brace for the national team during a 6-1 win against New Zealand.